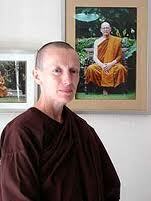 Sister Kovida is a Theravaden Buddhist nun from the Thai Forest tradition of Ajahn Chah and has trained both at Amaravati in Hertfordshire and Cittaviveka in West Sussex. ‘My practice is following the Buddha’s teaching of the Four Noble Truths. From this I offer guidance in developing awareness and insight into how we suffer and the way out of suffering. Please bring a lunch to share or something for yourself. For roads within the immediate vicinity of Bosham House view the Local Area Map (the open red circle marks Bosham House). This entry was posted on May 7, 2011 at 2:46 pm and is filed under News, Programme, Teachings. You can follow any responses to this entry through the RSS 2.0 feed. You can leave a response, or trackback from your own site.